In an uninsulated house, draughts through windows, doors, unused fire­places, gaps between floors and skirt­ings, ill-fitting doors and windows and ceiling hatches can account for as much as 15 per cent of your heat escaping. All this can be avoided by using proper draught-proofing. It is important not to overdo draught-proofing. Both you and your home need some fresh air, especially if you are to avoid damp. If you have boilers, real fires, gas, oil or paraffin or bottled-gas heaters fresh air is essential. And to avoid condensation there must be adequate ventilation in rooms in which moisture is produced, such as the kit­chen. An extractor fan will help but opening a window is best. There are many ways to draught-proof a window from the very cheap and simple, right through to double-glazing, but draught-proofing is much easier if your windows are hinged or pivot rather than sliding or sash. 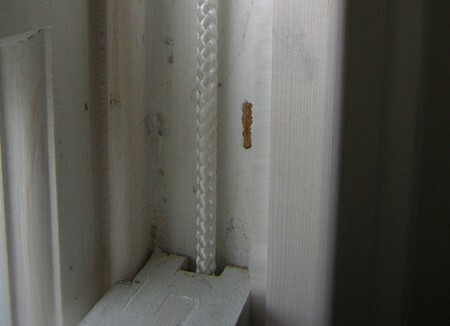 There are various types of strip that can be stuck around the edges of windows to stop draughts coming in. Masking tape is the cheapest to use but not the most visually pleasing. Do not use other adhesive tapes as they leave a mark when removed. You can buy ad­hesive foam strips which are cheap but, like masking tape, need to be replaced every year. Metal and plastic strips are more expensive, but last longer. 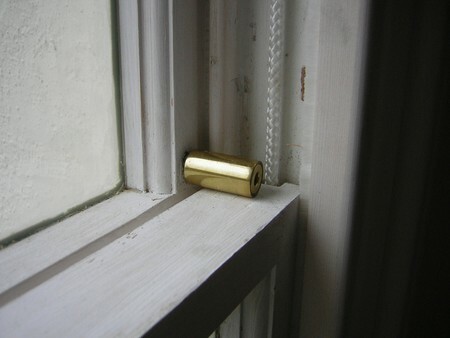 Make sure that windows can still be securely closed after draught-proofing. For draught-proofing the door frame (two sides and the bottom – leave the top free for ventilation) you can use adhesive plastic foam strip, which is cheap and easy to use but will probably need to be replaced annually. Plastic or metal strips can be glued or nailed to the inside of the door frame and are not noticeable when properly fitted. The gap between the bottom of the door and the floor is probably the largest and may be the problem to solve first. There are various types of aluminium strip fitted with plastic or rubber strips or brushes, which attach to the door, the floor or to both. There are also automa­tic draught excluders which lift up when the door opens. You can make your own seals with carpet or display felt. There are also less high-tech solutions, such as the very simple stuffed fabric draught-excluder or the thick curtain which can be hung from the top of your door (do not hang it from the door frame or you will not be able to open the door). Draught-proof letter-boxes and pet-flaps too for ad­ditional warmth. Unused chimneys and flues can be sealed to cut off escaping heat. If you block up a fireplace opening, fit a ven­tilated cap on top of the chimney stack and a ventilation grille in the chimney-breast or flue, to prevent condensation. Or block off the chimney at the top to prevent down-draughts. Do not block up a flue permanently: few things are cosier than an open fire, provided your flue is in good repair. Heat can also escape through floors. You can lose up to 15 per cent of your home heat under-foot. Gaps in floor­boards and skirtings are the main causes of heat loss through wooden floors. A large, and costly, project may be to lift all the floorboards and put glass-fibre or a similar matting material underneath them to act as insulation. On a smaller scale, you can fill the gaps between floorboards with plastic wood or papier mache. Wooden strips nailed down between the edge of the skirting and the floorboards will also help remove draughts. Using fitted carpets, ideally with felt or rubber underlay, will reduce heat loss, particularly with a concrete or tiled floor. Again, make sure you do not stop under-floor ventilation, which is neces­sary to protect the floor timbers from dampness and rot. Never block up any airbricks in external walls whether they are over- or under-floor: they are there to provide ventilation. If a room is well heated all day and if it has a large window, you may consider double-glazing, especially if you wish to cut down on noise as well: but as glazing is expensive, it may only be worth doing if your existing window is in bad con­dition and needs replacing anyway. There are two main ways of double-glazing: secondary glazing and sealed unit glazing. Secondary glazing is when you leave your existing window in situ and add a second window which opens independently. The advantages of sec­ondary glazing are that you can keep any-period windows and window frames while removing any draughts from existing ill-fitting windows. Secondary glazing can be sliding or hinged and can match your existing windows exactly so that it is discreet and barely noticeable; usually, however, secondary glazing is made of metal or plastic. Sealed unit glazing is when one window consists of two sheets of glass accurately spaced apart in the factory and looking very similar to one pane of glass. The advantage of this type of glazing is its convenience, because it means you only have one window to open and close. A third, and the cheapest, form of double-glazing is to simply cover your window with plastic sheeting for the winter. Attach the sheeting with double-sided adhesive tape or drawing pins and do not despair if some of your view is lost. Perspex panels are sturdier, reusable and easier to see through. Once again you will not be able to open your window and you will also need to find somewhere to store the panels in the summer, when not using them. For ideal heat insulation, the air space between the two panes of glass should be no more than 2 cm wide. For sound insulation an air gap must be at least 4 in (10 cm) wide and a heavier grade glass must be used. You will have to decide which of the two is your greater priority. If you are in any doubt, consult a double-glazing specialist. Always make sure double-glazed windows are easy to open or it could be dangerous if there is a fire.